This summer was a little different than others. As if my husband and I needed to spend more hours on the road, we did. Every mile was worth it though, to spend as much time as possible with my 97-year-old grandma. My mom and other family members took turns staying with Grandma since a brief hospital stay in April for congestive heart failure. It took this extremely independent woman, with 80-plus years of taking care of herself and others, some time to adjust. Family time was aplenty as my cousins, aunts and uncles saw a lot of each other during meals and photo sharing with Grandma. She was a woman filled with sass and honesty but plenty of warmth for good measure. Knowing the struggles she balanced in her lifetime makes me wave a white flag to my biggest problems. After days of goodbyes from her family, Grandma passed away on August 16. She slyly grinned and nodded in agreement. White cookies, apple slice bars, cottage cheese rolls and seafoam candy were her specialties and will surely be missed in our family, though many of us can make these items after closely studying one of our favorite cook’s methods and secrets. The biggest secret found through the research … using a one-handled rolling pin. Norman and Adeline Marks (the author’s grandparents) sat in front of a Farm Bureau sign. others when supplies were tight. Working for households as a cook, maid and babysitter were the benchmarks of her humble beginnings. To her, there were no other options. You figured out how to get the job done no matter the workload involved. One of the visions that sticks in my head from my childhood is attending church with Grandma. Sitting by her side, I would always be startled by emotion and tone as she sang a hymn. ‘Doing the best job with what you have,’ was a motto of Grandma’s but, ‘giving your worries to the Lord,’ was another. I remember walking into Grandma’s house shortly after I had accepted the job with Wisconsin Farm Bureau. Sharing my exciting news was downplayed by her excitement for me. 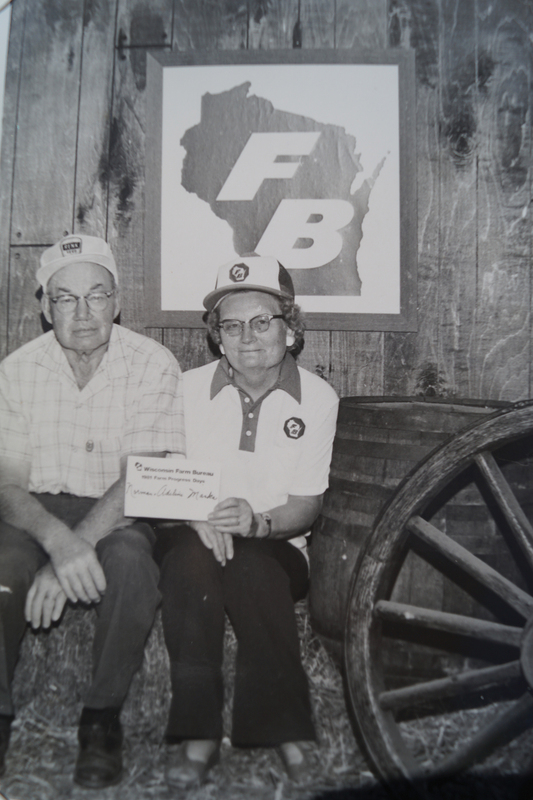 A women’s committee member and chair for many years in Outagamie County, Grandma knew exactly what Farm Bureau was all about –more than I did at the time. Through the years whenever I stopped to visit, Farm Bureau was always on the subject list. “What are you up to now? Who is being featured in Rural Route next? Often, we talked about one of her favorite roles in Farm Bureau, which was helping organize the annual bake-off. While I might regret sharing this because I am sure there is some photo evidence somewhere, I recall being a model for her apron fashion show. Part of the evening’s agenda would include some history on aprons and Grandma always knew she could recruit some of her granddaughters for the task. Farm Bureau memories and connections live on in more ways than we realize and the pride for Farm Bureau is strong. Just as my connection to Farm Bureau brought up many stories with Grandma, I have heard other Farm Bureau members discuss their connections as well. It’s not uncommon to see our tight-knit organization mentioned in a funeral announcement. Waupaca County member Art Pethke passed recently. My colleague who attended the funeral said his pride for Farm Bureau was evident by the pins and awards that he requested to be displayed. We hear of that happening often with our devoted members who pass on. Pride is evident in Farm Bureau through stories and reflections shared over coffee or in an obituary. As we approach our centennial year, the stories will be in surplus. What a special thing to be a part of. Take time to listen and cherish those stories and reflections through fellowship with other members. Our time on earth is limited and so is our time with each other. Amy Eckelberg was raised on her family’s dairy farm near New London in Waupaca County. As an active member of the Sandy Knoll 4-H club, Eckelberg grew up showing hogs and dairy animals at the Waupaca County Fair and was a New London FFA member. She graduated from the University of Wisconsin-Green Bay in 2012. 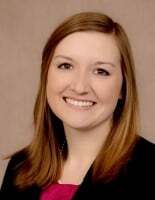 Amy is the Executive Director of Public Relations for the Wisconsin Farm Bureau and resides in DeForest with her husband. What a beautiful story…..It’s great to hear the words of someone who truly appreciated where they came from. I always felt a bit sorry for those city/town kids, who had no idea what it was like to grow up on a farm and being surrounded by family who loved each other…..right until the very end.